Hi everyone, it's Cindy here again to share with you my latest creation. Know anyone with a soft spot for soft dolls? I'm excited to share with you an altered/mixed media/assemblage piece! I participate reguarly in the Viva Las VegaStamps! swaps, and our recent theme was Button Fairies! The idea is that there is a "fairy" or being at the top, and a trail of buttons where the legs should be. The buttons are most often threaded on a wire to give them stability and to help shape them. I've never been one for "rules" and really wanted to use a burlap string. I LOVE the look and feel of May Arts' burlap string, but I also wanted the stability and shaping of wire. Let's start with the fairy building, though! First! 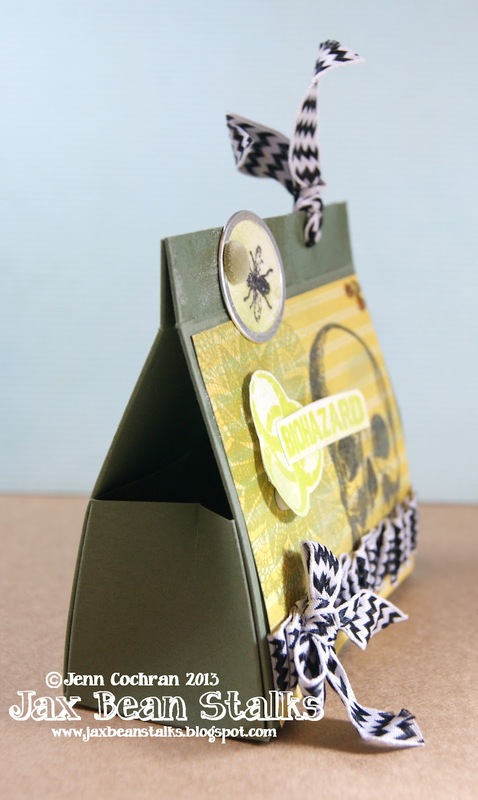 Gather your supplies: Helmar's Fabric Glue and Craft and Hobby PVA Glue, May Arts Burlap String, Viva Las VegaStamps! 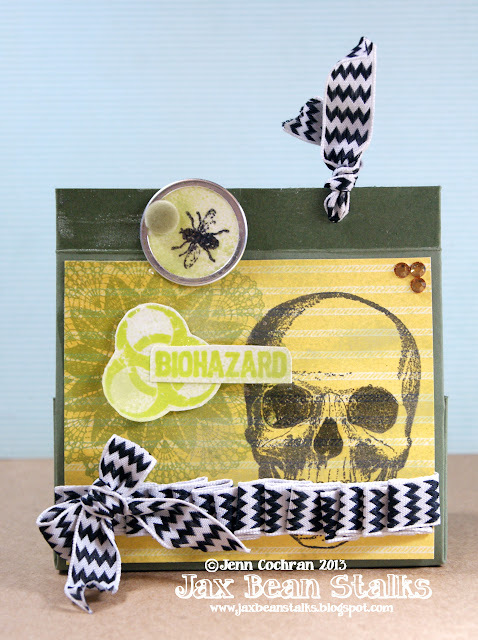 Octopus Stamp, UmWowStudio Cicada Chipboard, Ranger's Archival Ink, Distress Markers, cardstock, buttons, acrylic block. 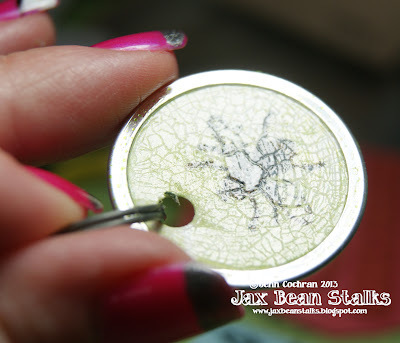 Stamp, color and fussy cut your fairy. Trim the chipboard to fit behind your fairy. Adhere the wings to the fairy using your PVA Glue. It's perfect for bonding paper to paper. Thread the burlap string through the buttons including the beads at the bottom and knot. Now adhere your button tail to the fairy, I've made sure snuggle the button right up to the chipboard so that there's some sturdiness in the piece. Now.. back to our previous problem.. the loosey goosey string tail! Turn over your fairy and pick up your Fabric Glue. Curve the tail in the direction you want (remember it's upside down and will actually curl the other way face up). Now soak your string in fabric glue and let dry! We're basically using it as a stiffiner. When it's dry..... flip it over and be ready to be amazed. You've now got the "standard" wired tail with a softer string look! Jen Matott here to share a scrapbook page that I did recently with the focus on a found object that is a constant in my artwork. I was walking along and found this doily on the sidewalk. I was on vacation so I hadn't brought my materials with me to create... this was a serendipidous find! It was outside a restaurant and I took a photo of it with my feet. This page started on a woodgrain print paper and some paint was added to the background. I used Helmar Quickfix Permanent Tape Runner to adhere all the paper layers down. That tape is quick and easy and grabs right on! I added some fun elements like the kraft paper camera embellishment and wanted it to be raised up on the page so I used 1/4" ZapDots! 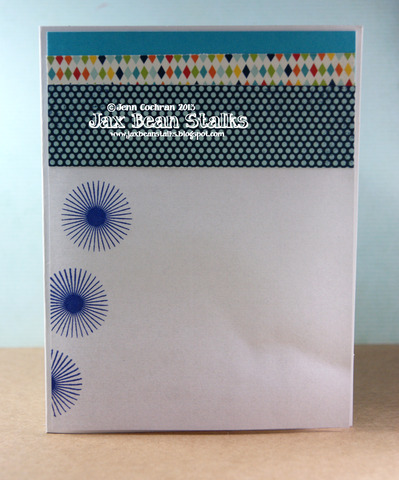 They are perfect for some height on the page and are so easy to use! There was this cool pastel paper and I added a few different font stickers to create the title. I never trust that the adhesive of these stickers will stay so I use the Helmar Craft Glue on it for good measure. It also holds wooden embellishments perfectly too! I backed the frame with some paper. Finally, I added some ribbon and a fabric flower and adhered both with Helmar Fabric Glue. It won't soak through the fabric and holds the fabric on most any surface! Make sure you look down when you are out for a walk and see what treasures you see! I wish I had kept this little doily but I'm sure I'll find more treasures soon! Have a creative day! Hello Helmar Adhesive lovers! Jenn here with another project for you today. With graduation's still taking place I felt it fitting to share with you a card my best friend ordered for her son for his kindergarten graduation. My entire card is assembled with Helmar Professional Craft Glue!! I mean every single layer is put together and secured with the Craft Glue. I love this stuff! It dries fast and clear and I never have to worry about one of the cards I have sold falling apart. Even the inside of the card is put together with Helmar Professional Craft Glue. I love the way the bow turned out. I used Sheer 3 Strip Blue from Really Reasonable Ribbon. 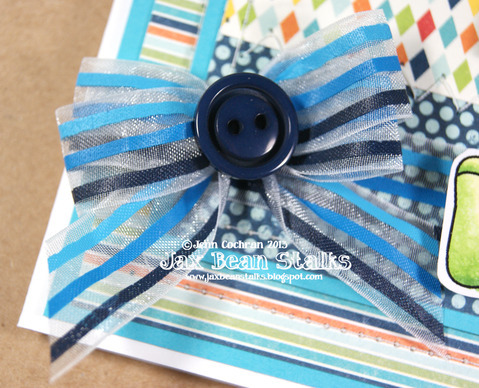 I attached the bow to the card and the button to the bow using Helmar 450. It is like super duper awesome glue. It dries SO fast. Perfect for embellies! My image is from Scrappin Doodle. I achieved lots of dimension with the Helmar Zap Dots. They are perfect for raising images off the card. Thank you so much for visiting. I hope I have inspired you to craft today...and/or use Helmar Adhesives!! Hi everyone! Kiki here and I'm really pleased to be able to share with you this extra large tag project I've been working on. I had some plasticized tags sitting around the house, that were originally used to demonstrate products. But now that the products were discontinued, what to do with the tags? Well, I decided to use them to create extra large tag art. To give you an idea of the size of the tag, it is approximately 8 inches tall. I used different Helmar products on this as well, and had some fun playing. I used Helmar Premium Craft Glue to glue down some paper to the tag for a background. See those dot embellishments? I used some Helmar Zapdot White Round 1/2 in" dots and then pressed them into some micro beads to create a new glitter addition to my stash. You can see one of them close up on this image. Be sure to press them firmly into the Zapdot so that they stick. You may end up with a few stray beads otherwise. I made a total of three of those bead Zapdots to tuck in around the tag. I then embellished the tag with flowers, lace and word art, all using the Helmar Premium Craft Glue (so that I could reposition them if I didn't like the placement), and voila! A new altered tag! I know that someone will enjoy this as a gift to display in their home. I'll be making more of them in the future too! Hope you enjoyed this project and have a great week! Hello blog friends...this week the Helmar Design Team has been sharing projects that utilize stamps from Viva Las VegaStamps. 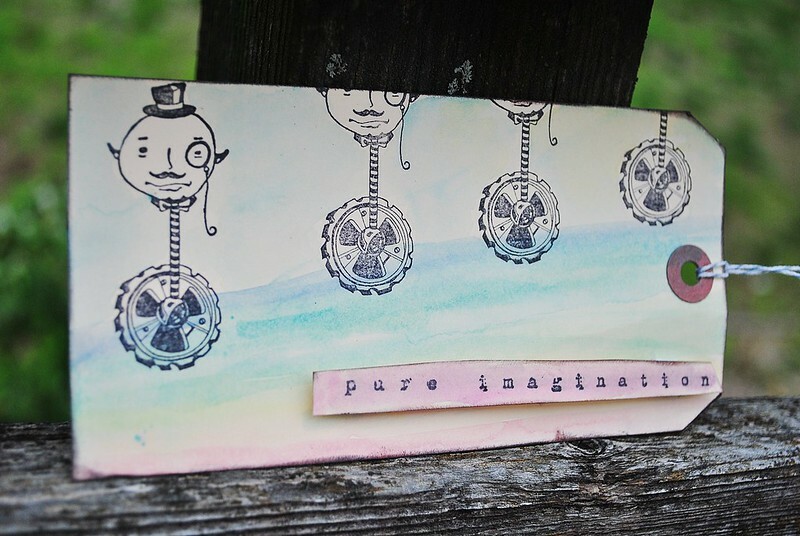 I love to make Mail Art and I thought this would be a perfect way to show off the fun & funky nature of these stamps. 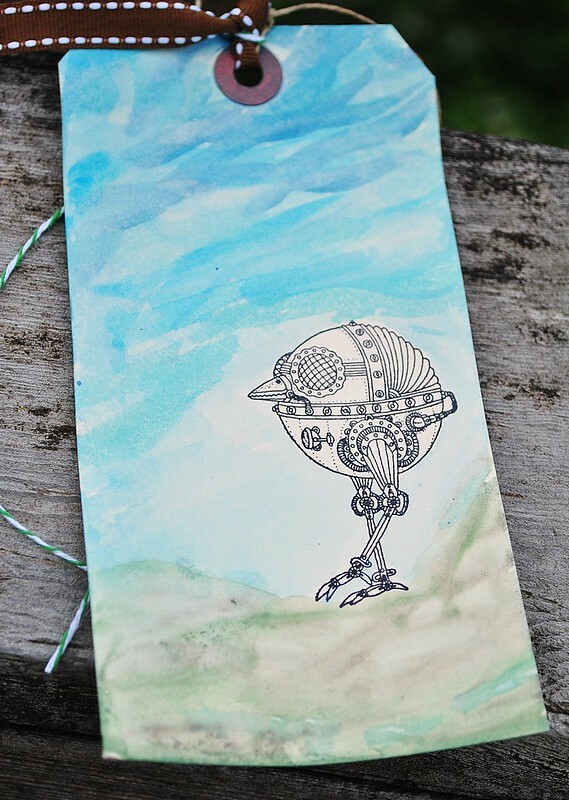 What is Mail Art...it is centered around sending small scale works through the postal service and includes postcards, paper, a collage of found or recycled images and objects, rubber stamps, or anything that can be put in an envelope and sent through the mail. Because I created these little works of art before I know that HELMAR is the only adhesive that will survive the handling of them. One of the requirements is the size and the rule is Postcard sized - minimum 3 ½” x 5” to maximum 4 ¼” x 6. The backgrounds used are left over scraps from various projects that I ink sprayed and stenciled onto 140LB. watercolor paper. Helmar Acid Free glue has been specifically formulated for memory albums, book binding,mounting photographs, preserving old or precious books, documents, scrap books, most craft projects, etc. Excellent adhesion to dense papers, high flexibility, long term life of the bond. Once dry I outlined several of the stamped images with various markers. To finish off each piece I added Ranger Stickles in Crystal to make various pieces pop. Aren't these fun? Now at any time I have a fun way to send a quick note in a gift or package. Thanks for stopping by...hope you have a great weekend filled with lots of creative time! What an exciting day for me! It's my first official post for Helmar, and I couldn't be happier to be posting here as part of the design team. And what fun to be working this week with Viva Las VegaStamps! I wanted to share an art journal page I created using Helmar Decoupage and Craft Paste and Helmar Zapdots, as well as some beautiful texture stamps from Viva Las VegaStamps. I generally like to start my art journal pages with various scraps of paper, cloth, lace and book paper. I arrange them randomly without putting too much thought into where they'll be, and what will show. This is primarily because as I'm working on an art journal page, I don't generally work with a final product in mind, but rather let the process take me there instead. I used the Helmar Decoupage and Craft Paste with a paint brush to adhere the paper, lace, fabric and book paper to the kraft paper base. Then I begin to layer on other embellishments that are typical to scrapbooking, such as journal spots and a photo, but first, I needed some additional texture and little pops of colour. So I used the stamps to get me that extra pop. It's starting to take on some shape, and structure. 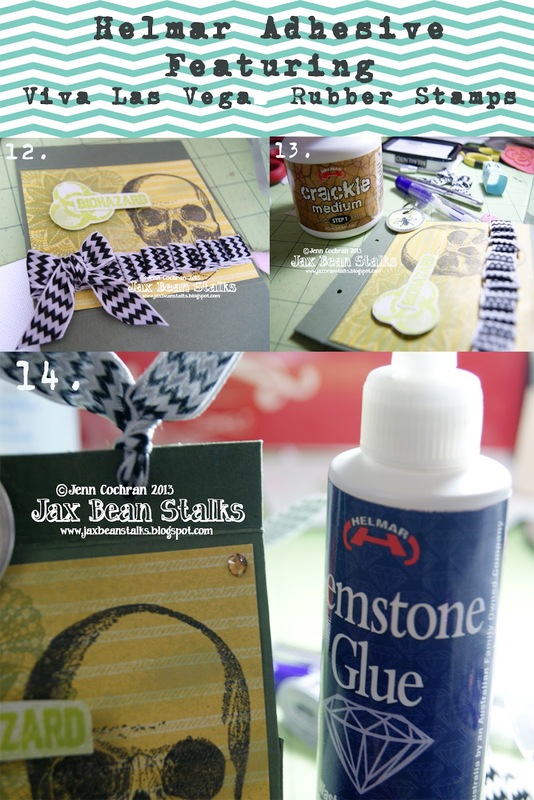 I use Helmar Zapdots to pop up some embellishments for dimension. In this case, I popped up the doily and the photo. Don't you just adore that Instagram stamp? Finally, I added some washi tape, Color Shine spray, and finally some Perfect Pearls to add some random accents without adding a lot of additional layers. I really like how it turned out as a final page. I hope that you'll give art journaling a try using Helmar and Viva Las VegaStamps, and just play! 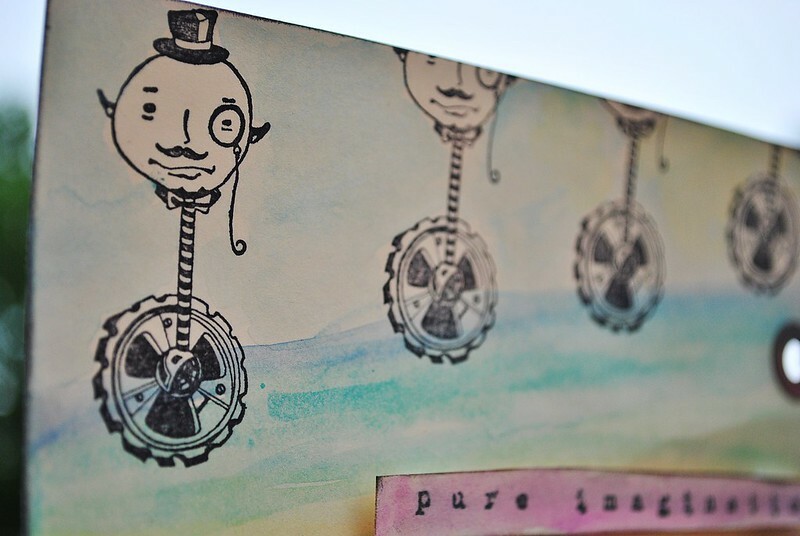 I'm looking forward to seeing your layouts, altered art and art journal projects this week! 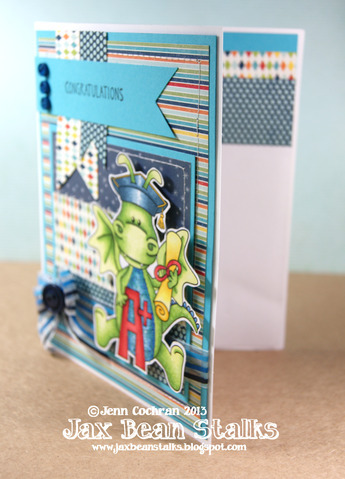 Give a Lift to a Stamped Image with Zap and Scrap Dots! I am so excited to share some creations I've made with some of my favorite products in the whole world....Helmar and Viva Las VegaStamps! I have become a stampaholic with all the choices VLVS offers....they really spark my creativity, and are versatile to use in many ways! I like to try new techniques using large shipping tags. I plan to art journal one day, but for now, I find the size and shape of shipping tags perfect for stamping, painting, and creating a small "canvas" that takes dampness without warping. Like my first try with watercolor below. 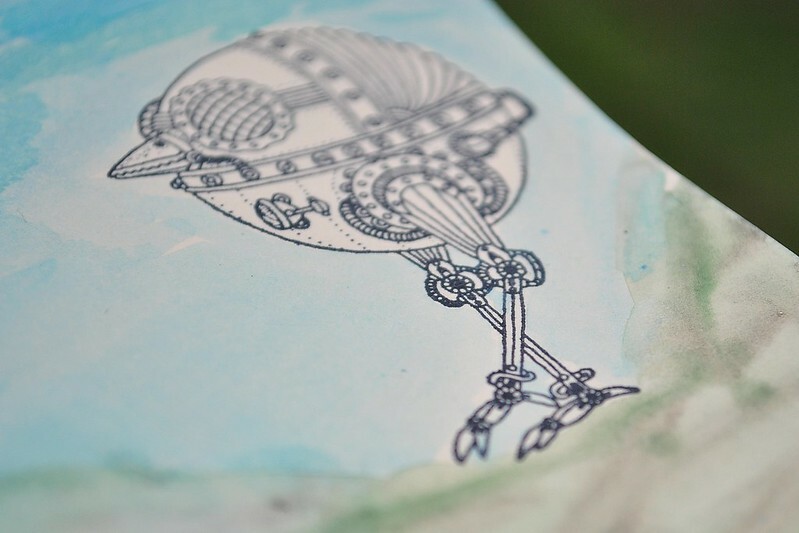 I stamped the fun Viva Las VegaStamps "Steampunk Beaked Thingie", and then watercolored a scene for him to be living in. Next, I watercolored a "rainbow ramp," and then stamped the whimsical "Wheelie Monocle Face" I also stamped a VLVS sentiment, and popped it up a bit, using Helmar Zap Dots, which added great dimension. 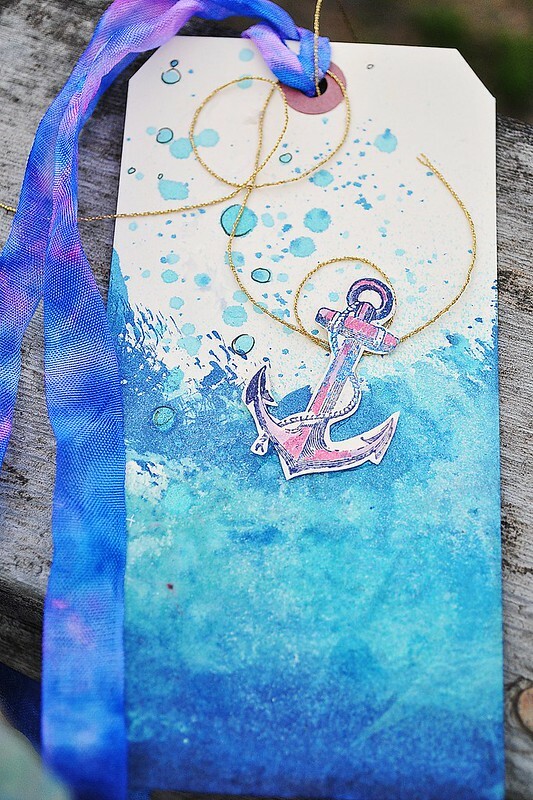 Finally, I created an "ocean" using a tag gently dragged through different colors of blue/aqua mist. With the left over mist, I covered a paintbrush, and flicked it on the upper part of the tag, and outlined a few of the "droplets" with a fineliner. 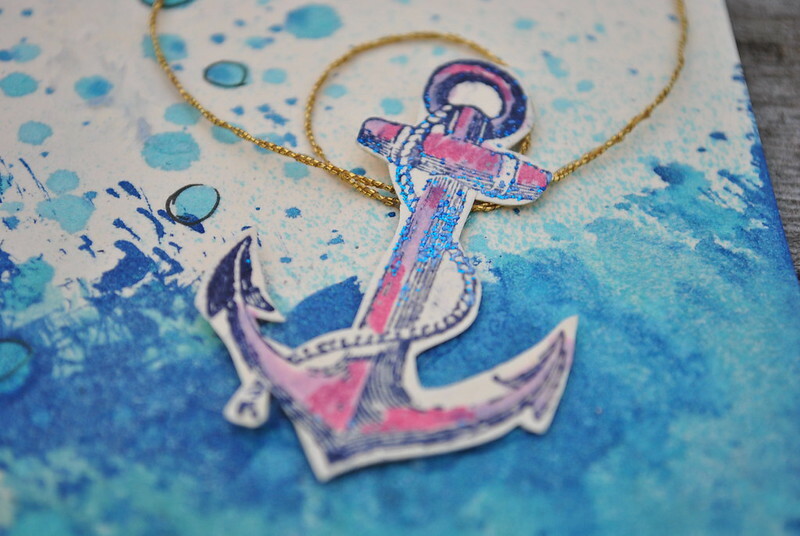 I stamped a gorgeous VLVS anchor and added 2 colors of embossing powder, and colored it quirky pink. 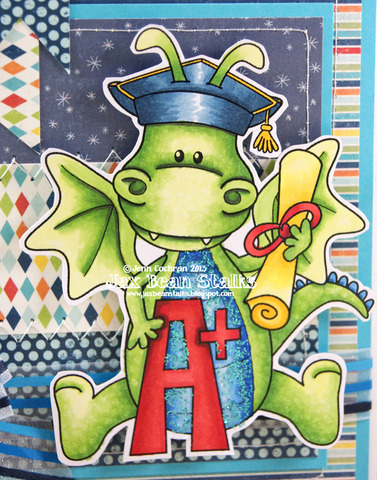 After fussy cutting it, I added it to the page using Helmar Liquid Scrap Dots for the perfect amount "pop up." Thanks for stopping by today. Next time you want to give a technique a try, use an economical shipping tag and the "lift" of dimension with Helmar Zap and Scrap Dots! Hello friends and followers of HELMAR!!! Jenn Cochran here and I am back with another tutorial. I am so excited to have been able to create this fun spooky purse with rubber from Viva Las Vega Rubber Stamps! They have so many unique choices in their stamp line that you could make a project for just about anyone using these stamps. Now on to my tutorial. Hope you all are inspired to make something fun. 1. Use and 8.5x11 piece of cardstock. Score the 11" side at .75", 4.5", 6.5, and 10.25". Score the 8.5 side at 2" and 6.5". 2. Create an "L" with your Helmar Professional Craft Glue. 3. You can see the "L" in this photo. Repeat this step on all 4 corners. 4. Now quickly fold and hold! 5. Now the stamping/decorating begins! 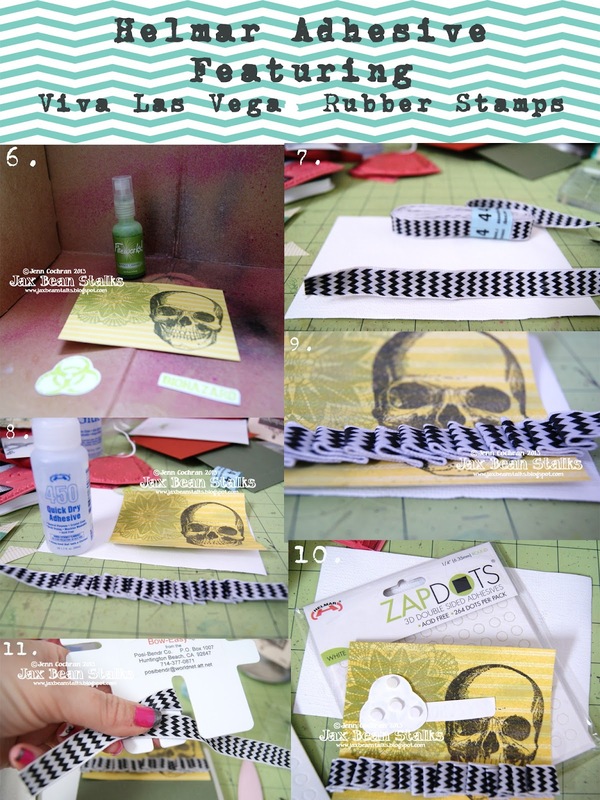 I am using Viva Las Vega Stamps for this step! 6. After I stamped a 4.25 x 3.5 piece of patterned paper, I then ink sprayed my piece with Tsukineko Fireworks Sprays. 7. Now comes the ribbon. This ribbon is from Really Reasonable Ribbon. It is Chevron with wire. Love how it stays put when I folding it! 8. To secure the ribbon I am using my trusty 450 Helmar Quick Dry Adhesive. 9. 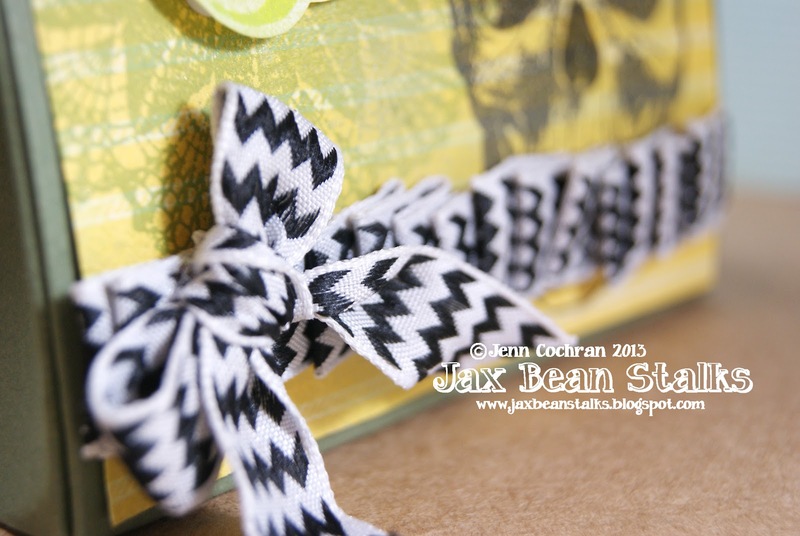 I ran a bead of glue along the back of the ribbon and then secured it in place on the patterned paper. 10. Place Helmar Zap Dots on the back of the sentiment. 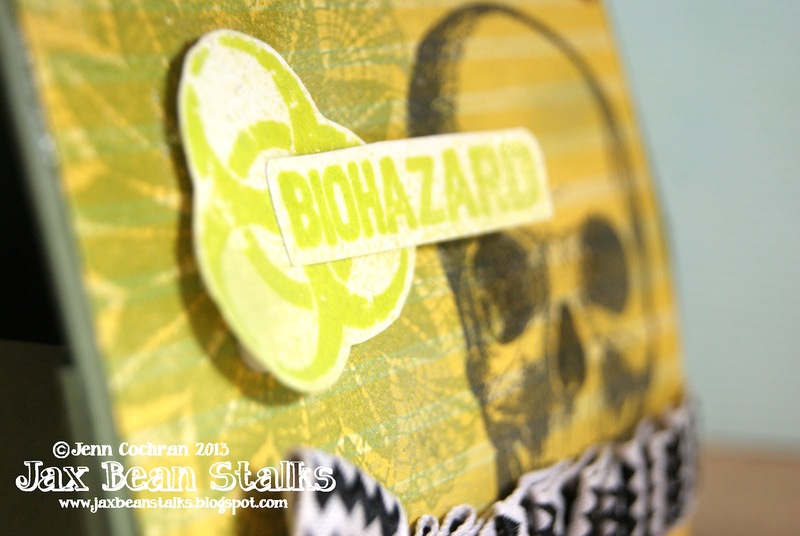 In my case it is a BioHazard from Viva Las Vega Stamps. 11. My final piece of ribbon is a bow. I used my Bow Easy. 12. 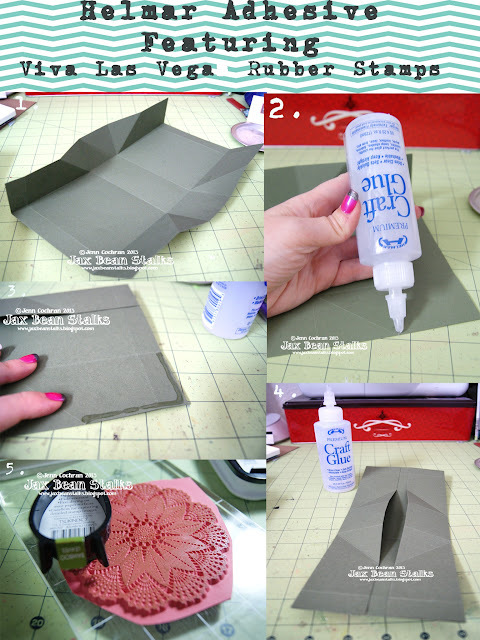 Using Helmar Professional Craft Glue, I glued my layout in place on the front of my purse. 13. Crackle time!! Using Helmar Crackle, I crackled various sections of the front of my purse. Including embellishments too! 14. Final step is to add some bling using Helmar Gemstone Glue. I find that it is fast drying and doesn't require much to adhere the gemstone in place. I really like the way the Helmar Crackle looks on this embellishment. This was a fun project. I really hope you find inspiration to create your own purse. There are so many different possibilities...they are endless. One of my favorite parts about crafting is finding and marrying beautiful products by amazing companies, and today (And ALL week!) 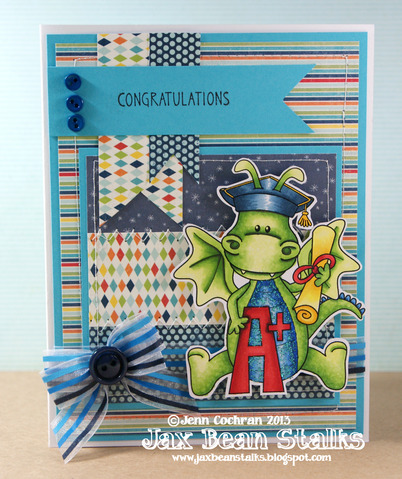 we're sharing projects on the Helmar USA blog and the Viva Las VegaStamps! blog using adhesives and rubber stamps!! I've chosen to marry the two on a 12x12 layout featuring some of my favorite designs from UmWowStudio. I have a habit of leaving my layouts untitled, wbut if this one had a title it would be "Design - it's what I do best." The layout is on a 12x12 recycled piece of cardboard and has been distressed with walnut stain distress ink. There are a total of 7 Viva Las VegaStamps! rubber stamps used on this page including the corners, hexagon background, row of stars, nautical star, round star, and line of chevrons. I've also used UmWowStudio hexagon confetti, Gauche Alchemy washi tape, Ranger archival ink in black, gesso, Studio Calico's Mr. Huey in opaque white and cheesecloth. Adhesive choice was important for this layout, as the cardboard is recycled and I was gluing down a few different materials (paper, cloth, chipboard.) I went with Helmar's Premium Craft Glue and think it was the perfect choice! It allowed me to not worry about switching between glues, and is sturdy enough to keep all my materials glued down!